Great price and good location. About a ten minute walk into town and even shorter walk to beach. Very accommodating host, we were greeted with a nice cold glass of orange juice and sat down and given and map of Hvar marked with all the best beaches, bars, restaurants. Fully equipped kitchen and bathroom always clean. Ive is a most welcoming host, always around if you need any help for anything. Lovely cozy place, very well located, super close to the old town after a short walk. The room was well presented and the beds and pillows were very comfortable. There's an equipped kitchen you can use if you want to cook your meals. Of all our stays in Croatia, this was the one we liked more so far, highly recommended! Thank you Ive! Orange is a great place to stay - especially if you have one of the rooms overlooking the sea. Everything is very clean and Ive is a charming host. Fantastic! Our room was very good and the place itself is so nice! Ive was a very nice host, he meet us with fresh orange juice and explained a lot about Hvar. Love it and defo recommend! The best host ever ! Ive will welcome you nicely with his peaceful energy, explain to you everything about Hvar. Ive is a blessed guy! the place is very relaxing and peaceful you will feel it. The room was very comfortable and clean, with air con and a big bed, I felt like home. Kitchen is well equipped and clean. He was always there to say “ enjoy and be happy”. It was a really nice stay. Fantastic hostel , with a wonderful host! Thanks Ive for the great advice and welcome during our stay at Orange! I had a great 2-nights stay at Orange. 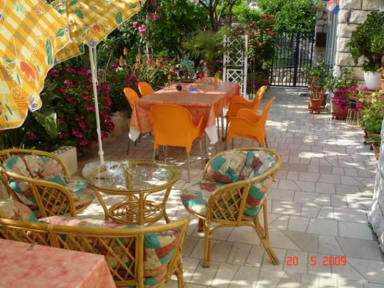 Owner Ive is really friendly and knowledgeable, the double room in off-season price was good value, the kitchen is nice and well-equiped, which is great as the restaurants in Hvar are quite overpriced. I loved the terrace with view and fitness equipment. Such an idyllic place to stay- the reception area with butterflies flying around is beautiful, plus the unbroken view looking out to the bay. Can thoroughly recommend.